For 25 years, Country Homes & Interiors has been peeking inside the homes of house-proud rural folk with a flair for design and an eye for architecture. Buy a single copy or subscription to Country Homes and Interiors magazine. It is a chunky glossy magazine with bags of eye-catching design and furnishing ideas. For readers wanting to share in the spirit of classic and contemporary country living, this monthly magazine should be number one on your Christmas wish list. Home isn’t just where the heart is, though; it’s where you can do your cooking, pursue your hobbies and put your feet up in perfect contentment. 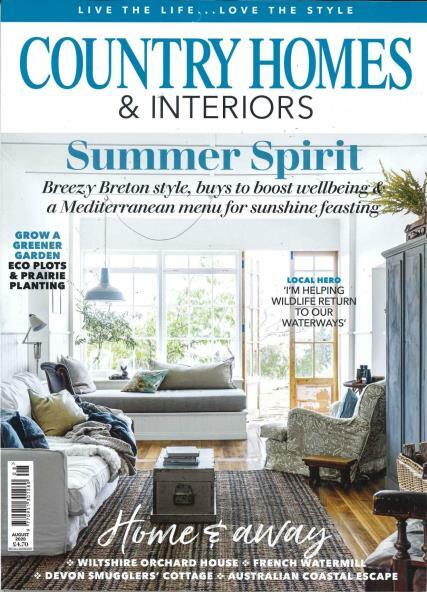 Country Homes is dedicated to all aspects of domestic life – from top horticultural tips to seasonal recipes for keen cooks. Crafts and general lifestyle articles also feature regularly. Perhaps most handy of all, however, is the information on where furnishings and designs featured in the magazine can be found and how much they cost. Very good. wide range of ideas. Just wonderful to have a good quality English publication in a German country. Nice pictures and good articles, enjoyable to read.